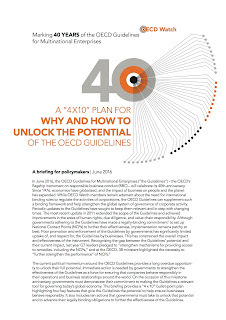 Law at the End of the Day: OECD Watch to Governments: "A 4X10 Plan For Why and How to Unlock the Potential of the OECD Guidelines"
OECD Watch to Governments: "A 4X10 Plan For Why and How to Unlock the Potential of the OECD Guidelines"
June 2016 marks the 40th anniversary of the adoption of the Organization for Economic Cooperation and Development (OECD) Guiding Principles for Multinational Enterprises. Over the course of those 40 years, the MNE Guidelines have become an increasingly important governance framework through which states, enterprises and civil society have sought to "legislate" conduct norms for enterprises--and impose regulatory obligations on states with respect to those norms. That development, in turn, marks the rise of new structures of regulatory systems that are necessary as the objects of traditional regulation—and increasingly of administrative oversight through regulatory governance mechanisms grounded in objectives, monitoring and assessment-approval systems—have increasingly become impossible to control by any single state, no matter how powerful. But such emerging structures continue to use the language and the sensibilities of the conventional systems that no longer fit the regulatory problem posed by the engagement of enterprises in the construction and exploitation of production chains across the globe. And, like law systems before it, its stakeholders have sought to use this emerging system strategically—states to privatize regulation, enterprises to internationalize conduct obligations in the societal sphere, and stakeholders to launch internationalized hard law embedded in conventional state legal orders. 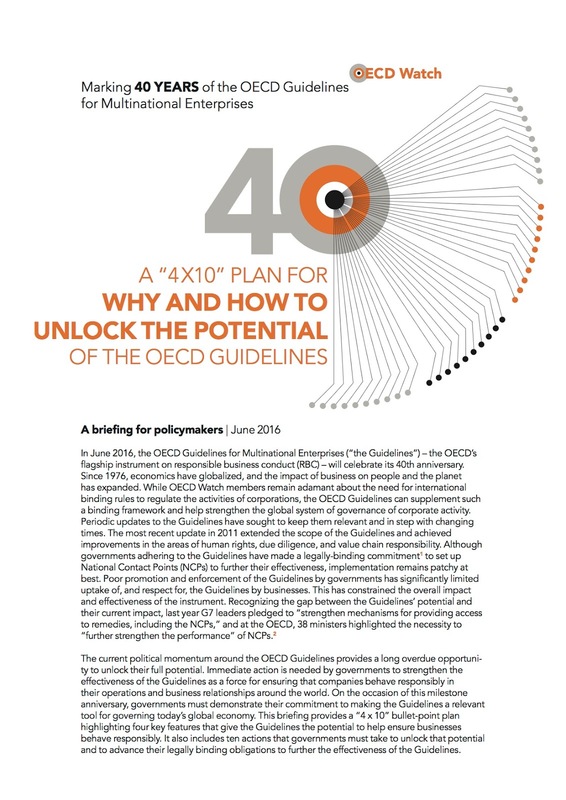 In June 2016, the OECD Guidelines for Multinational Enterprises ("the Guidelines)– the OECD’s flagship instrument on responsible business conduct – will celebrate its 40th anniversary. Periodic updates to the Guidelines have sought to keep them relevant and in step with changing times. The most recent update in 2011 extended the scope of the Guidelines and achieved improvements in the areas of human rights, due diligence, and value chain responsibility. Although governments adhering to the Guidelines have made a legally-binding commitment to set up National Contact Points to further their effectiveness, implementation remains patchy at best. On the occasion of this milestone anniversary, governments must demonstrate their commitment to making the Guidelines a relevant tool for governing today’s global economy. This briefing provides a “4 x 10” bullet-point plan highlighting four key features that give the Guidelines the potential to help ensure businesses behave responsibly. It also includes ten actions that governments must take to unlock that potential and to advance their legally binding obligations to further the effectiveness of the Guidelines. Parts of the Report and brief comments follows. It may be accessed (PDF HERE).